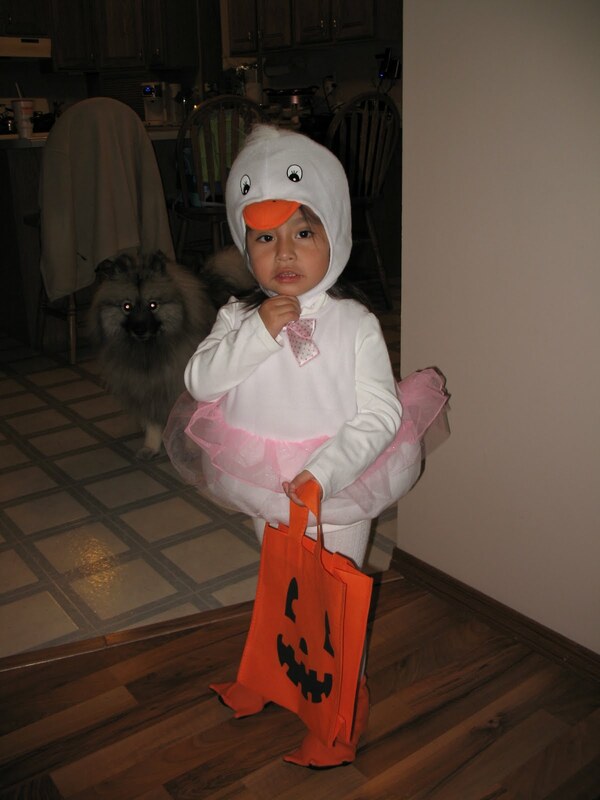 Last Halloween was a first for Lili, but I chose not to take her trick-or-treating. Instead I dressed her up as a ladybug and she helped me pass out candy. She had been home 7 months at that point, but I wasn’t sure how she would handle all of the costumes and felt it would be better for her to be home in familiar, safe surroundings if she became frightened. None of the costumes frightened her last year so this year we went shopping for a costume and I let her choose. 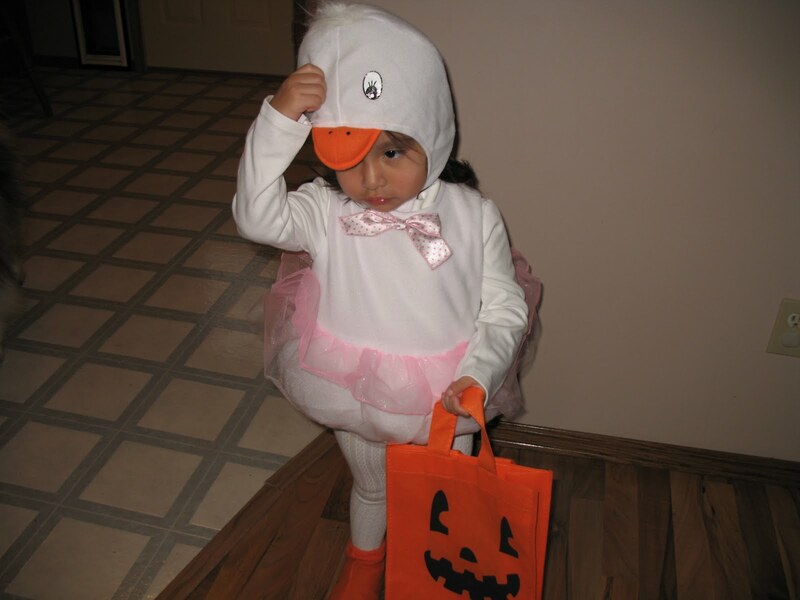 Yes, she chose a duck costume (although one woman asked her if she was a chicken). Because we’ve had so much rain over the last couple of days, I decided to use the stroller and am so glad I did. Not only was water standing in several places, but the temperature felt more like December than October. Having the stroller allowed me to wrap her in a blanket which was a really good thing. We went out for about 1/2 an hour and then headed back home to wait for my sister-in-law and her daughter ‘the vampire’ to come and join us. We went out again for another hour and returned home with a nice load of candy. The only scary part of the evening was the candy bowl with the skeleton hand that tried to grab Lili’s hand. 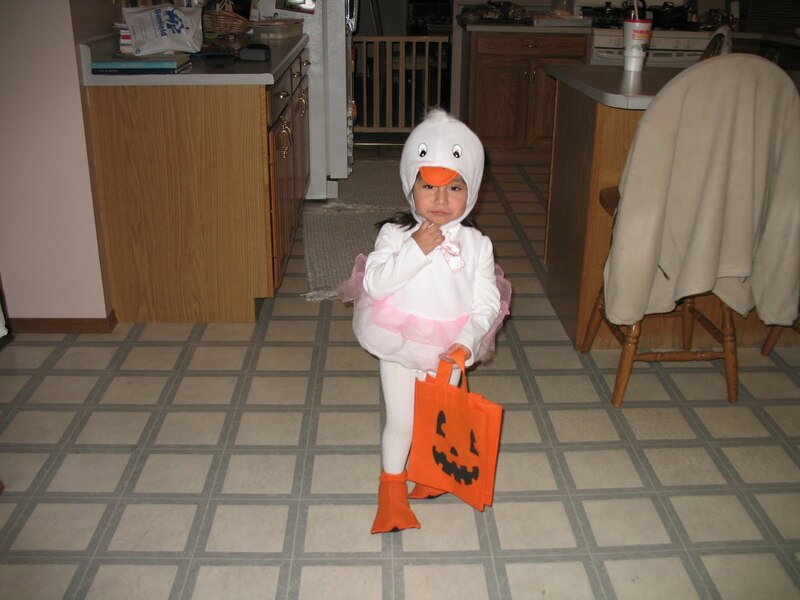 My little duck didn’t waddle away, but actually ran away from the candy bowl. And I was worried about the costumes scaring her. Sounds like you had a great Halloween. The costume is adorable.